A selection of tearsheets, showcasing the work of Kristian Bertel in print. Some of this work is commisioned assignments and brought in magazines. Besides the travel publications like International Traveller Magazine, the editorial demand for travel photography exists in industries like travel, photo education and photography schools. Many travel photographers also give photo advices for photo students, helping travel enthusiasts take great travel images during their trips. 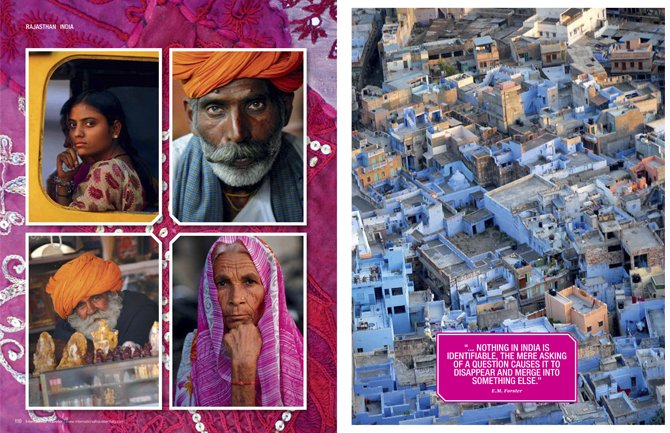 Traveller Magazine, a magazine published by Australian Traveller Media. editorial and independent reviews that made the original Australian Traveller Magazine the most trusted travel magazine in Australia. the highest selling travel magazine in Australia. Over the years some of the published work of the photographer can be seen here on the tearsheets section of the photographer's website. The photos have been chosen by editors for publication in national and international magazines worldwide. These compelling, intimate, humanitarian images are a part of a notable photography recognision is published in print. After several years of photo works, the photographer made his first of what would become many trips to India. Traveling with little more than a bag of clothes and camera gear, he made his way across the subcontinent, exploring the country with his camera. Since his first trip to India, the photographer has gone on to create stunning images in the Maharashtra state and countless streets and neighborhoods. His work spans portraits, cultures, Indian traditions and contemporary culture alike, yet always retains the human element that made his image of the Indian girl a beloved image by many. Something which the photographer on assignments can use, taking the photographs that he loves the most of sceneries of street markets and colorful festivals in India. For him traveling broadens the mind and where he learns about other people, other places and other ways of doing things. As a Hindu country, India is still dominated by the caste system and is more conservative, especially outside major cities. Therefore, please do not dress liberally and avoid strict tenderness in public. In temples, take off your shoes. The peculiarities of Indian culture mean that timetables for buses and trains are only guideline values. The people are very helpful. Who gets involved, experiences an incredible affection and also deceleration. Culinary, the journey through India is a culinary delight. The many spices and fresh fruits create an exotic taste experience. Just make sure everything is well cooked or fried and you are not drinking any tap water. In addition to summer and winter, there is still the rainy season in India in July and August. In general, it is very hot in the summer and particularly humid in the south. For a trip to India, therefore, winter, even if you already need warmer clothes for the cool nights in the north. A magazine is a publication, usually a periodical publication as the travel magazine seen above, which is printed or electronically published and also sometimes referred to as an online magazine. Magazines are generally published on a regular schedule and contain a variety of content of travel destinations with themes. As the photographer learned these travel magazines are generally financed by advertising, by a purchase price, by prepaid subscriptions or a combination of the three. In the case of written publication like International Traveller Magazine, it is a collection of written articles. This is why magazine publications share the root with travel magazines and in India, retail stores such as department stores. Editorial travel magazines as seen below also focus on the field of natural light and in the field of ambient light photography. Publishing is the dissemination of travel destinations such as India making information available to the general public. In some cases with editorial photography, authors may also be their own publishers, meaning originators and developers of travel content also provide media to deliver and display the content for the same. Also the written publisher can refer to the individual who leads a publishing company or an imprint or to a person who owns or heads a magazine. Traditionally, the term refers to the distribution of printed works such as books and newspapers. With the advent of digital information systems and the Internet, the scope of publishing has expanded to include electronic resources such as the electronic versions of books and periodicals, as well as micropublishing, websites, blogs, travel publishers and the like. 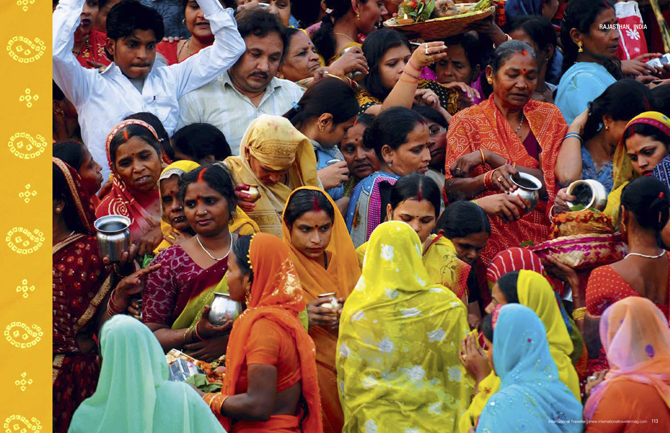 For about 5,000 years India has been celebrating life and all its pleasures. Despite the changes and diversities in India, the country is still a picturesque and a unique tourist destination. The country's civilization is among the oldest in the world and the imaginations of tourists are always captivated by India's legends and culture. There are many places to visit and if you see the places your imagination will surely be colorful. Rajasthan, India's westernmost state is the very essence of exotic India. To really get a sense of the desert state, nothing comes close to a camel safari. India combines the most terrible and the most beautiful at the same time. And the photographer is interested in both the beauty and the ugliness of the country, such as India's poverty. The amount of people is unmanageable and the streets are never quiet: mobile kitchen stalls, sales booths with every conceivable goods, hasty pedestrians, dusty cars, ringing rickshaws, half-naked beggars, sleepy cows. Sugar cane juice is freshly squeezed at one corner, sacks of spices are lined up and carefully piled up in a pile waiting for beaten goat heads on their shoppers. Lean men sleep immovably on the roadside, while loud hoisting trucks run right past them. Ragged children of all ages are curious about every foreign visitor. Dogs and chickens search the rubbish on the road for something edible. Incredible India is beautiful and terrible at the same time. Travelers traveling on the Indian subcontinent split themselves into two camps, for some, it is a dreamland, in which they return again and again. For the others it is a simple nightmare, which they never want to repeat. Myth, magic and modernity and India is back in and with the Palace of the Winds, colorful exotic and exciting cities, the many faces of the hip subcontinent are both fascination and inspiration. The north of India discovered for you with the photographs with their unforgettable experiences such as the photographers pictures of the country to know the world from its most exciting side. For the first time one can read about the insights by the photographer and it is a region of fascinating contrasts in the Golden triangle between Delhi, Jaipur and Agra, where magical splendor and fascinating modernity mix. New Delhi the capital of India with its thousand year old history, is also the city with the most sights. Here, among the ruined fortifications of the old fort of Purana Quila, during the last excavations, it was discovered that the city is equated with Indra-Prastha, the legendary metropolis of the Aryans. However, the first historical records date back long time ago, when the Rajput princes were based in the city. Prithviraj, the last Hindu king who ruled Delhi lost his life in a battle almost 1000 years ago. Until the British colonial rule then ruled by Muslim rulers. Today's Delhi consists of two distinct parts. on the one hand the Old Delhi with its typically oriental quarters, its narrow streets and bazaars, its temples, mosques and other historical monuments. On the other hand, the New Delhi, which was created symmetrically as a garden city. Here, among the tombs and mausoleums, memorial sites of noble rulers and kings, Delhi is as it was designed by the British. wide boulevards, pristine gardens, scattered colonial summer houses and shady avenues. The Rajpath Boulevard begins at the Indian Gate and runs past the imposing Parliament building dead straight to the gates of the Rahtrapati Bhawan Palace, the residence of former viceroys. In Mumbai the photographer was located above one of the slums at a small staircase leads directly into a alley to the houses. There are a few stone walls, others consist of corrugated iron and others have a large plastic tarpaulin instead of a roof seeing an outdoor laundry filled with water or soap. Bedlakes, towels, uniforms for cooks and waiters, colorful shirts and pants fluttering on long clotheslines to dry and between the stone arches stand men and women, washing one piece of cloth by hand for an hour and all day hands in soapy water. A few leeches are taken from a leash where a woman carries them in a large basket on her head to a dugout. But not everything is clean in India. Generally tourist stomachs are simply not prepared for a country like India and no matter how hard you try to keep all hygienic rules and not get sick, nearly every Indian traveler will ultimately suffer from a diarrhea. 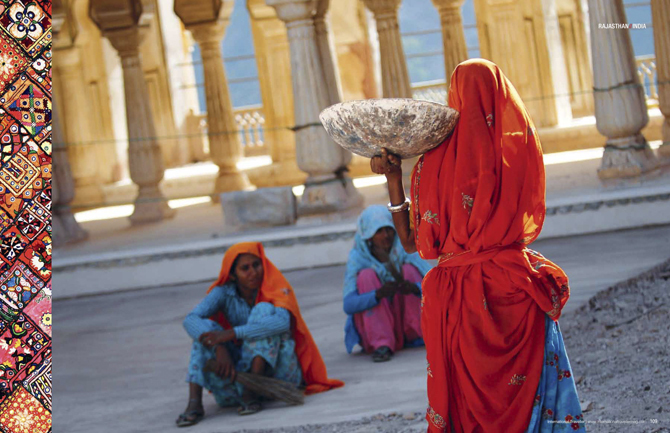 Hygiene in India is undoubtedly a difficult topic for travelers. This not only concerns food, tap water or toilets, but also accommodations. In fact, you can stay in India very well and cheaply, especially in the touristically developed areas. Still, it does not hurt to pick up a few more rupees now and then to avoid stained bed sheets and bed bugs. Anyone who still has to look at the money, the photographer recommends for your own well-being always a silk sleeping bag or an in-bed sleeping bag to have in your luggage. One of the other classic situation as a traveler in India is the misunderstanding of the 'Yes'. When waving a rickshaw on the roadside and call the friendly driver a destination, then he nods, we negotiate to the mark for the transport price and then the traveler climb the rickshaw. But after a while one will see that he drives in a circle. Of course, the rickshaw driver does not know where the traveler want to go. Had he not nodded "Yes, no problem" or an approving nod in India does not always mean "yes". Saying no to the Indians is not very special. If you ask in India for the way, so you will always get directions, no matter whether the questioned him really knows. Saying no is frowned upon in India and you are always friendly, helpful and obedient to guests. It is therefore always suitable to use a map with Indian script to aid in visualizing the goal. A ritual is a stereotyped sequence of activities involving gestures, words and objects as seen in the picture from India, performed in a sequestered place, and designed to influence preternatural entities or forces on behalf of the actors' goals and interests. Rituals may be seasonal, hallowing a culturally defined moment of change in the climatic cycle or the inauguration of an activity such as planting, harvesting, or moving from winter to summer pasture or they may be contingent, held in response to an individual or collective crisis. Contingent rituals may be further subdivided into life-crisis ceremonies, which are performed at birth, puberty, marriage, death and so on, to demarcate the passage from one phase to another in the individual's life-cycle, and rituals of affliction, which are performed to placate or exorcise preternatural beings or forces believed to have afflicted villagers with illness, bad luck, gynecological troubles, severe physical injuries and the like. Other classes of rituals include divinatory rituals such as ceremonies performed by political authorities to ensure the health and fertility of human beings, animals and crops in their territories as initiation into priesthoods devoted to certain deities, into religious associations or into secret societies and those accompanying the daily offering of food and libations to deities or ancestral spirits or both. Indian religions are practiced or were founded in the Indian subcontinent. They are sometimes classified as the dharmic religions, as they all feature dharma, the specific law of reality and duties expected according to the religion. Hinduism is a synecdoche describing the similar philosophies of Vaishnavism, Shaivism and related groups practiced or founded in the Indian subcontinent. Concepts most of them share in common include karma, caste, reincarnation, mantras, Yantras and Darsana. Hinduism is the most ancient of still-active religions with origins perhaps as far back as prehistoric times. Hinduism is not a monolithic religion but a religious category containing dozens of separate philosophies amalgamated as Sanatana Dharma, which is the name by which Hinduism has been known throughout history by its followers. Held along the banks of the holy Ganges River, this festival features cultural programs of classical music and dance. The highlight of the festival is on the last day, when more than a million clay lamps are floated down the river at dusk amidst chanting of Vedic hymns as part of Dev Deepavali, which means "the Diwali of the Gods" or "Festival of Lights of the Gods" is the festival of Kartik Poornima celebrated in Varanasi, Uttar Pradesh, India. It falls on the full moon of the Hindu month of Kartika in November to December and takes place fifteen days after Diwali. The steps of all the ghats on the riverfront of the Ganges River, from Ravidas Ghat at the southern end to Rajghat, are lit with more than a million earthen lamps the so-called Diyas in honour of Ganga, the Ganges, and its presiding goddess. The gods are believed to descend to Earth to bathe in the Ganges on this day. The festival is also observed as Tripura Purnima Snan. The tradition of lighting the lamps on the Dev Deepawali festival day was first started at the Panchganga Ghat in 1985. During Dev Deepawali, houses are decorated with oil lamps and colored designs on their front doors. Firecrackers are burnt at night, processions of decorated deities are taken out into the streets of Varanasi and oil lamps are set afloat on the river. The main rituals performed by devotees consist of Kartik snan, which is taking a holy bath in the Ganges during Kartika and Deepdan, where an offering of oil lighted lamps to Ganga are made in the evening. The Ganga aarti is also performed in the evening. The five day festivals starts on Prabodhini Ekadashi and concludes on Kartik Poornima. Besides a religious role, the festival is also the occasion when the martyrs are remembered at the ghats by worshipping Ganga and lighting lamps watching the Aarti. This is organized by Ganga Seva Nidhi when wreaths are placed at Amar Jawan Jyoti at Dashashwamedh Ghat and also at the adjoining Rajendra Prasad Ghat by officials of the Varanasi District. The festival is a major tourist attraction, and the sight of a million lamps, which are both floating and fixed lighting the ghats and river in vivid colors have often been described by visitors and tourists as a breathtaking sight. On the night of the festival, thousands of devotees from the holy city of Varanasi, surrounding villages, and across the country gather in the evening on the ghats of the Ganges to watch the Aarti. The local government makes several intensive arrangements to ensure order during the festival. From the Aarti at the Dashameshwar Ghat, all buildings and houses are lit with earthen lamps. Nearly 100,000 pilgrims visit the riverfront to watch the river aglitter with lamps. The Aarti is performed by twentyone young Brahmin priests and twentyfour young women. The rituals involve chanting hymns, rhythmic drum beating, conch shell blowing and brazier burning. Boat rides in boats of all sizes along the riverfront in the evening are popular among tourists, when all the ghats are lit with lamps and Aarti is being performed. As the photographer had gained knowledge about the vast majority of Indians engage in religious rituals on a daily basis. Most Hindus observe religious rituals at home and the observation of rituals vary greatly amongst regions, villages and individuals in India. Devout Hindus perform daily chores such as worshiping Puja, fire sacrifice called Yajna at the dawn after bathing usually at a family shrine and typically includes lighting a lamp and offering foods before the images of deities, recitation from religious scripts like Vedas, Puranas singing hymns in praise of gods and so on. A notable feature in religious ritual is the division between purity and pollution. Religious acts presuppose some degree of impurity, or defilement for the practitioner, which must be overcome or neutralized, before or during ritual procedures. Purification, usually with water, is thus a typical feature of most religious action. Other characteristics include a belief in the efficacy of sacrifice and concept of merit, gained through the performance of charity or good works, that will accumulate over time and reduce sufferings in the next world. Puja or Poojan is a prayer ritual performed by Hindus of devotional worship to one or more deities, or to host and honor a guest, or one to spiritually celebrate an event. Sometimes spelt phonetically as Pooja or Poojah, it may honour or celebrate the presence of special guest and guests or their memories after they die. The word Puja means reverence, honour, homage, adoration and worship. Puja rituals are also held by Buddhists and Jains. In Hinduism it is done on a variety of occasions, frequency and settings and it may include daily Puja done in the home, to occasional temple ceremonies and annual festivals. In other cases it is held to mark a few lifetime events such as birth of a baby or a wedding or to begin a new venture. The two main areas where Puja is performed are in the home and at temples to mark certain stages of life, events or some festivals such as Durga puja and Lakshmi puja. Puja is not mandatory in Hinduism. It may be a routine daily affair for some Hindus, periodic ritual for some and rare for other Hindus. In some temples, various Pujas may be performed daily at various times of the day in other temples, it may be occasional. Puja varies according to the school of Hinduism and may vary by region, occasion, deity honored and steps followed. In formal Nigama ceremonies, a fire may be lit in honour of deity Agni, without an idol or image present. In contrast, in Agama ceremonies, an idol or icon or image of deity is present. In both ceremonies, a lamp or incense stick may be lit while a prayer is chanted or hymn is sung. Puja is typically performed by a Hindu worshipper alone, though sometimes in presence of a priest, who is well versed in a complex ritual and hymns. In temples and priest-assisted event Puja, food, fruits and sweets may be included as sacrificial offerings to the ceremony or deity, which, after the prayers becomes Prasad, which means food shared by all gathered. During his first vacation in India, he wanted to visit the famous sights. The Red Fort, Humayun's tomb and Chandni Chowk in Delhi, the Taj Mahal in Agra and the barren desert of Rajasthan were among his list. He had his camera always at hand to hold everything. In India there is a large number of Hindus. Spirituality is, of course, integrated into everyday life and faith is practiced practically and pragmatically. So even with important rituals, water and food are sold loudly or air is fanned out for a few rupees. Indians have an appropriate approach, because water, food or cooling during long rituals is very important. Boasting cultural India includes not only the famous Golden Triangle Delhi - Agra - Jaipur, one of the most popular tourist routes in India, but also a fascinating variety of further highlights from the camelquiting Thar Desert to the River of Ganges in Varanasi and pilgrim places. Spread over the entire region, a wealth of magnificent historical and religious buildings awaits one to be explored in the photos by the photographer. 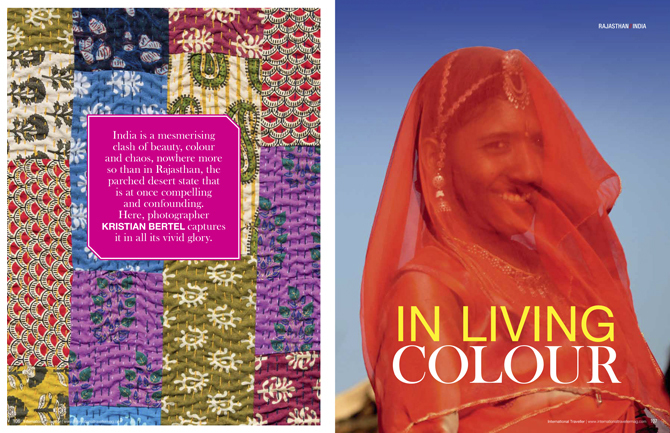 Plunge into the hustle and bustle of a colorful India with issues such as environmental problems and the situation of women. In addition, the India photographs provides background information and comprehensive stories also for editors and editorial use.